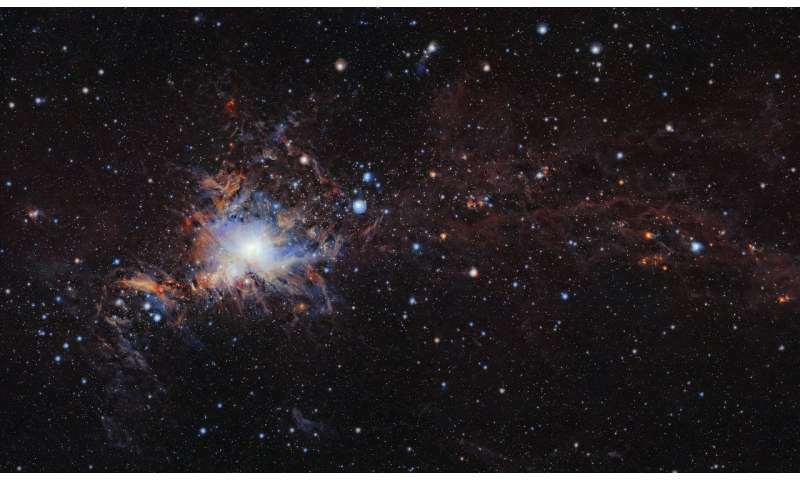 This spectacular new image is one of the largest near-infrared high-resolution mosaics of the Orion A molecular cloud, the nearest known massive star factory, lying about 1350 light-years from Earth. It was taken using the VISTA infrared survey telescope at ESO's Paranal Observatory in northern Chile and reveals many young stars and other objects normally buried deep inside the dusty clouds. The new image from the VISION survey (VIenna Survey In Orion) is a montage of images taken in the near-infrared part of the spectrum by the VISTA survey telescope at ESO's Paranal Observatory in Chile. It covers the whole of the Orion A molecular cloud, one of the two giant molecular clouds in the Orion molecular cloud complex (OMC). Orion A extends for approximately eight degrees to the south of the familiar part of Orion known as the sword. VISTA is the world's largest dedicated survey telescope, and has a large field of view imaged with very sensitive infrared detectors, characteristics that made it ideal for obtaining the deep, high-quality infrared images required by this ambitious survey. The VISION survey has resulted in a catalogue containing almost 800 000 individually identified stars, young stellar objects and distant galaxies, This represents better depth and coverage than any other survey of this region to date. The new image represents a step towards a complete picture of the star formation processes in Orion A, for both low and high mass stars. The most spectacular object is the glorious Orion Nebula, also called Messier 42 seen towards the left of the image. This region forms part of the sword of the famous bright constellation of Orion (The Hunter)(constellation). The VISTA catalogue covers both familiar objects and new discoveries. These include five new young stellar object candidates and ten candidate galaxy clusters. Elsewhere in the image, we can look into Orion A's dark molecular clouds and spot many hidden treasures, including discs of material that could give birth to new stars (pre-stellar discs), nebulosity associated with newly-born stars (Herbig-Haro objects), smaller star clusters and even galaxy clusters lying far beyond the Milky Way. The VISION survey allows the earliest evolutionary phases of young stars within nearby molecular clouds to be systematically studied. This impressively detailed image of Orion A establishes a new observational foundation for further studies of star and cluster formation and once again highlights the power of the VISTA telescope to image wide areas of sky quickly and deeply in the near-infrared part of the spectrum.